Fits Flat Screen Monitors from 37-46"
The Jelco ELU-42R RotoLift Case (Black) is an ATA shipping case made for large, flat-screen displays with screens from 37-46". The case is made from high-impact ABS plastic laminated over 3/8" wood frame with custom-cut interior foam and steel corners and aluminum trim. It has a built-in EZ-LIFT that gently lifts the monitor from the case in portrait viewing position or just rotate screen and lock into place for landscape viewing. 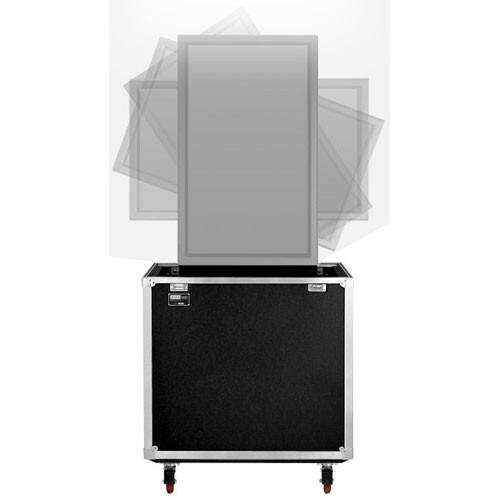 It is used for individuals, corporations and staging professionals who need to safely move and securely store large monitors. When the monitor is positioned for landscape viewing, the EZ-LIFT can be lowered to conference table height or raised high enough to be used for large room presentations. There is room in the cabinet for installation of mini computers or wireless components. The RotoLift case is transported by recessed, spring-action handles or four 4.0" large locking casters. Exterior: Steel corners and aluminum trim. Box Dimensions (LxWxH) 66.0 x 48.0 x 32.0"